Secondly, I have shelves of books that I need to complete. Don’t we all? I can’t justify a huge Christmas book haul if I don’t finish some of these. So, I created a Tag merging my two fave things…books and fall. Here we go! Crisp fall leaves fall to the ground. The red, yellow and orange looks oh so pretty. What book on your TBR shelf is just as pretty? To go with the fall color scheme, I’m going to say The Fireman by Joe Hill. I love the burning fire all over this cover. Fall scents are so warm and inviting. Old books smell just as welcoming. What’s the oldest book on your shelf? (or had the longest) I think The Secret Garden by Frances Hodgson Burnett is the oldest and I’ve had Can You Keep A Secret by Sophie Kinsella the longest…I think. Fall means cooler temps, thank goodness! What book on your shelf would be the perfect “curl up with a blanket” book? I have a couple here. I think The Husband’s Secret by Liane Moriarty would be a comfy read. I also think I’d love to finish City of Lost Souls by Cassandra Clare under a warm blanket. Fall also brings Halloween. Do you have a spooky or creepy book on your shelf? No, I don’t have anything creepy and I’m disappointed about that. I may have to scour some other shelves to find something…or buy The Singular and Extraordinary Tale of Mirror and Goliath by Ishbelle Bee recommended to me by Sam over at Sam’s Nonsense. I know this defeats the purpose of tackling my TBR, but it happens right? Thanksgiving is for family, whether it’s blood or friendship. What book makes you feel all warm and fuzzy inside? That’s The Bean Trees and Pigs in Heaven by Barbara Kingsolver. I need to read these asap! Sweet Potatoes, Pumpkins and Apples are my fall favorites. What book are you just dying to read? The Body Electric by Beth Revis. I need to read this book!!! There is one downside to fall, shorter days (oh and that pesky heating bill). What’s one book sitting on your shelf that you aren’t too eager to pick up? I have a few. The Mistborn Trilogy, but only because they are big books and there’s 3 of them! Same goes for Wise Mans Fear by Patrick Rothfuss and The Fireman by Joe Hill. I think I’m going to save them for Sam’s (Thoughts on Tomes) Tome Topple. Lastly, Howls Moving Castle by Diana Wynne Jones. I didn’t get pulled in the last time I picked it up, but I didn’t give it much time. So, it’s probably just me. Fall means you can turn off the AC and open those windows wide. Do you have a book on your shelf that is like a breath of fresh air? The Storied Life of AJ Fikry by Gabrielle Zevin and The Secret Garden by Frances Hodgson Burnett. They are a change of pace for me. Fall always seems to go by too fast. Name the book you can get through the fastest and the one that will take you forever. I can blow through I’ve Got Your Number and Can You Keep A Secret by Sophie Kinsella. I’m sure of that! Joe Hill’s Fireman is going to take me months…I just know it. Lastly, we all cheat! LOL! If you’re going to cheat (buy books) during the months of Fall, what books would you deem worthy? If I’m going to sneak in some new books….they’d be The Girl of Fire and Thorns Trilogy, anything Robin Hobb that Sam recommends to me, Heartless by Marissa Meyer, and The Remnant Chronicles sound intriguing. *My Links are being super funky today. Hopefully they work! I’m sorry if they don’t! 1. Ready for a big adventure? This book will take you there…Ready Player One by Earnest Cline – This is the only book in the past couple years that I have reread. It gets me every time! This story is so intricate and detailed that just fall in love with it every single time I read it! 2. After a major workout, you are ready for some down time. Chill out with this book…Everything, Everything by Nicola Yoon – this book took me by surprise! I had received the ARC from NetGalley and read it in two days. The story was a cute contemporary that left me just a bit uncomfortable because I was always unsure as to what might happen next! 3. Your life is getting hectic. You need a quick read that’s worth your time. Try this…Killing Sarai by J. A. Redmerski – I devoured this book! It is a new adult story about assassins that I could not put down! I was so into this story that it definitely allowed me to forget about my life and surround myself with these characters. 4. In a new relationship and you are feeling giddy. Check out this cute couple…Fangirl by Rainbow Rowell – I don’t want to spoil the relationship in this book, but I just love these two together. If you haven’t read a Rowell book, you definitely need to! 5. Fairytales, Retellings and an Epic Imagination, Oh my! It doesn’t get any better than…The Forbidden Wish by Jessica Khoury – I loved this book so much. This is a retelling of Aladdin where you follow the story of the female genie. The way that the original story is woven into this new and unique tale is A+ work. Thanks again to Kristin for being an amazing Guest on my blog (Go Check out her channel!!! It’s linked above!!) and please stay tuned next week for Sarah-Jane’s answers (from TheBookLife and www.thebooklife.co.uk). If you would like to participate, please let me know!!! Also, please don’t forget to check out my other TWYMMF posts featuring Sam from Sam’s Nonsense, Michelle from MichellisLife and Jody from ThatOneGirlWhoReads.com. So, I haven’t done a review in quite awhile and I thought….maybe this book. Funny enough, I have a hard time articulating my feelings on this one. Maybe that’s why I chose it, because I have so much to say. This will be spoiler FREE. To start, I was recommended this book by two amazing friends. They have fantastic tastes and I knew I’d enjoy it. I did, but I had some slip ups as well. Here’s my thoughts! I want to start with characters, because a good book needs excellent characters. This book did not disappoint. I was absolutely in love with Lily and her obvious love interest (Spoiler free so…no names!). I also loved to hate the one villain (male) and simply adored the ultimate villain (female). Even the “side characters” were well developed and interesting. Well done! This book added some diverse characters and I really enjoyed that. Native American’s are not well represented in the books I’ve come across. I’ve found they are not mentioned at all or their culture is twisted by authors who know nothing about their beliefs. I thought this book had some good elements. That surprised me in a very great way. The author also included a gay character and I thought that was fantastic. I would have enjoyed a little more about their romance, but I liked that they were at least mentioned. Overall, I enjoyed the basic summary of this book. Worlds Collide. Magic Reigns. Love Burns. That kinda says it all. Worlds Collide: Lily gets thrown from her world, where she is riddled with life-threatening allergies and into a world where she is extraordinary. She is pulled there by Lillian her …counterpart, if you will. Here, Lily can thrive…if she can figure out what’s going on. I loved discovering the world and I never felt bogged down with descriptions. It all flowed nicely. Magic Reigns: I loved the magical elements in this world. I don’t want to give things away. So I’ll keep it vague, but I found the magic to be a unique and how it all tied together with Lily was intriguing. Love Burns: This love story made me swoon. It was quite obvious from…chapter 5 or 6 (?) who she was going to fall for, but I still loved it. I adored the male lead and although predictable, it was still a fun ride. Aaaaand here’s where I have some trouble. Now, I want to make note that I was extremely busy the week I read this book. I had some commitments and they physically exhausted me. That said, I didn’t have a strong desire to pick this book up during my down time. I enjoyed the characters and the basic plot, but there were no burning questions that I needed answered. While the book threw me some minor twists and turns, it still didn’t grip me. I could easily put the book down and choose something else to do. That said, when I was reading, I was usually enjoying what was going on. There were some moments throughout the book where the characters would be traveling or waiting…those moments did not interest me. I wanted to move on. Get to the juicy stuff! Sometimes, the lull would bring an epic action sequence and I would be hooked. Sometimes, it didn’t. Overall, I could kinda predict how things would pan out and that’s not something I enjoy. Yet, the ending was great and the characters did become dear to my heart. Maybe I could have been more pulled in if I didn’t take a lot of breaks…maybe not? Read Firewalker (Book 2)? The romance/ending was wonderful and so….I think I’d read book two. I just won’t be in a huge hurry. I’m still invested in the characters and I’m definitely curious about what happens…so yeah I’ll eventually read books 2 and 3. Thank you to my dear friends who recommended me this book. I can gush over spoilers privately with you and I’m very glad I checked this out! This Tag was Created By Kate at Girl Reading and I was inspired by Michelle at Michellislife to do it! Thanks, Michelle! Physical. I like the tangibility of a book in my hands. Paperback. Hardbacks are hard to hold and hard to shove/fit into a purse. In Store. I do order online for a great sale, but mostly in store. I’d love to own a bookstore…. Heroes. I love a great villian, but the hero has to be amazing and my fave books have amazing heroes. Maybe this goes back to my childhood? If the villain wins, I’m beyond upset. I’m still a Disney Princess hoping that Prince Charming will save the day! Uhh…I can’t remember if it was Trial By Fire or The Progeny by Tosca Lee. I honestly can’t think of anything weird, though I’m sure I’ve done it. The only thing I recall is paper…random folded post-it notes or ripped from a magazine. Yes!! The book needs to be in decent or excellent condition, but I adore book sales and come home with massive hauls! Mystery, Fantasy and a lil Sci-Fi. It’s mostly mysteries and fantasy for me! This is hard for me. I’d love to say “Character Driven books for sure!” I need excellent characters that I can relate too or want to be friends with. Yet, if that plot doesn’t pull me through…the greatest characters can’t save it for me. Short, but I hate books with 2 pages in a chapter. That’s so lame. Don’t do that. I like short chapters, because then I feel like I’m accomplishing something when I read 4 chapters today. If I read and read and read….and that’s just chapter one…I’m gonna have a hard time. Trial By Fire did that to me. I felt like the chapters were too long. – Books That Make You Laugh or Cry? Sophie Kinsella books always make me laugh. If I need a good laugh out loud moment (and then hide and pretend I didn’t just do that! ), I turn to Sophie Kinsella. Cry…the only book that’s made me cry (that I can recall) is The Raven King and I can’t tell you why cuz it’s a spoiler…probably not one you’d expect though…so no worries! No thanks. I don’t have a reason. I think for long drives it would be great, but then I couldn’t read the book at night without owning both copies. That would stink. So, I’d say no but I’m not against it. Yeah, who doesn’t? If it looks good…I’m more likely to pick it up and read the back or search for it on Goodreads. So, yeah. Wellllll….I don’t like most movie adaptations, but watching a book come to life on the big screen is pretty cool (if they somehow manage to do it justice). Yet, TV means that they can do it week after week. If done well, that’s kinda cool. I was two seconds from saying “Never! The book is ALWAYS better” but then….Shannara came to mind. Terry Brooks creates these amazing scenarios and worlds, but then his books fall flat. I’ve been disappointed by the ones I’ve picked up. The concept of Shannara was a genius one and thankfully MTV went with it. I love the show! I’d love to say Standalone’s. I kinda prefer them, because it’s once and done. I don’t have to buy 10 books to complete the story. Yet, I still find myself constantly buying series. I guess I enjoy more time with my characters and being sucked into their worlds. Also, the best fantasy stories are almost always series. So that’s a given. I tag Jody at thatonegirlwhoreads.wordpress.com (if two people Tag you, does that mean you have to do it? Like a Double Dare? LMAO!!! I double dog dare you! ), also Jen at combustiblereviews.com and Vicky at booksandstrips.wordpress.com. I’ve been outta the game for awhile, I hope you ladies haven’t done this one yet! I’d also love to see Ashley at BookishRealm do this and I’ve missed seeing more of Heather at pinkzebrareads…so I want her to do this too! Yaay!! Can’t wait to read/watch you!!! Hi! Welcome back to my The Way You Make Me Feel series! Todays guest is the phenomenal Sam from Sam’s Nonsense! I’m so excited!!! Thank you, Sam! Just like my previous posts, I gave Sam 5 scenarios (things that I sometimes feel and maybe you do too!) and her answers are below. Hopefully we can help you! 🙂 This time though, Sam will also be posting her answers on her channel as well!! So please read the post and then go check out her channel for more detailed responses! Here we go…. The Singular and Extraordinary Tale of Mirror & Goliath: A unique, rather creepy story in the Quentin Tarantino Style….I literally don’t know a more unique book! Even the typography is unique! Plus it’s a perfect halloween read! Hands down The Farseer Trilogy by Robin Hobb! (You knew it was coming) You’ll get lost in her fantastic characters and political intrigue and it’s all very exciting and at times a bit emotional and I love it to bits! The Woman in White by Wilkie Collins! Victorian Mystery at it’s finest! Persuasion by Jane Austen. A quick, heartwarming little romance story…enough to give you the warm fuzzies!! Hands down Anne of Green Gables! This book (and the whole series) Is very focused on friendship, love, and hope! Hope you loved her book choices and don’t forget to go check out Sam’s Channel (link above) for a video response! Thanks again, Sam for being a guest! Next Friday we will hear from Kristin from WhatsKappening and then on Sept 2nd, we will hear from Sarah-Jane from TheBookLife and thebooklife.co.uk! Please don’t forget to check out my other Guest Posts from Michelle and Jody!! Until next time…. I’m really in the mood for something creepy! Anna Dressed in Blood, a book I feel doesn’t get enough hype although they are filming a movie about it so hopefully that will change. It’s about a boy who kills ghosts that have died in tragic ways and have the ability to kill people. It’s a very Supernatural type of story. Also, can’t help but add The Diviners by Libba Bray. It’s historical fiction and creepiness all balled into one. It had a unique cast of characters and the main bad guy will make you not want to read it at night, that’s for sure. Have you read a string of disappointing books? Need something that will grab your attention? Read this: Trial by Fire by Josephine Angelini, witches, multi-dimensions, magic, romance… What’s not to love. Do you want paranormal elements, but NOT creepy? Try this The Lie Tree by Frances Hardinge, this is about a girl in the late 1900’s who’s family moves to an island because of a scandal in their hometown. She discovers a secret her father has been keeping about his work and the reason that the townspeople have it out for them. So fascinating, unique and imaginative. Seeking something touching? Jody’s got it covered! Storied Life of A.J. Fikry by Gabrielle Zevin. This follows an island bookstore owner through stages of his life, the joy and sorrow, trials and celebrations that he goes through with the people around him. It was kind of a slow read for me but still one that I loved so very much. It’s an amazing story. So, I’m having my first guest on my blog! This is SO exciting!! Plus, its my amazing friend Michelle from MichEllisLife! So that makes it even more special! Here’s how it works! If you saw my last post (same title) you saw that I choose books based on my emotions. So I created a post using some of those scenarios, hoping that you may also choose books the same way! If you feel sad, read this. If you’re lonely, read this…etc. So today, the fabulous Michelle has agreed to answer 5 questions/scenerios of her own. Here’s what she had to say! First I want to say thanks for having me on your blog. I’m so glad you’re posting more lately and it’s an honor and a privilege to join you on this page. Here are the questions you sent and my answers. Hope everyone finds something new to pick up. 1 Are u tired of your current genre and want to learn something new about someone else? For this I recommend If I Was Your Girl. This is a debut novel, released this year by Meredith Russo. If I Was Your Girl is a trans YA contemporary featuring a girl named Amanda who recently moved to a new town to escape her past and start over. I’ve been devouring LGBTQIA books lately because I feel like there is so much to learn about the queer community. I don’t like being ignorant of the world around me. As for reading about a person from another country (outside of the USA) I recommend A Strangeness in My Mind by Orhan Pamuk. This book takes place in Istanbul during the years of 1970-2012. Though this story is fictional it takes the reader through the streets of Istanbul and shows us the culture and daily life there. For this I would recommend either Unicorn Tracks by Julia Ember (if you’re looking for a stand alone) or the Mistborn series (if you’re looking for a longer commitment). Both have unique and interesting worlds and characters. They avoid modern tropes as well. Unicorn Tracks includes the intersectionality of both female characters and it’s great to see how that correlates to their decisions through the novel. Mistborn is action packed and has a unique magic system. Brandon Sanderson, the author of Mistborn, does a great job at making the action scenes, as well as the magic system, very understandable and easy to follow. 3 Feeling like you could bust the door down? I personally don’t think I can read while I’m angry but if you want a book that will get your blood pumping I suggest the Sweet Evil trilogy. I’ve recommended this one a lot lately but I felt so many emotions while reading this series: sexual tension, anger, disgust, hatred, sympathy, empathy and lastly sadness. 4. Do you need to escape reality for a bit? For this I suggest picking up the Saga graphic novel series. This series in an adult graphic novel series and does feature adult language as well as some graphic scenes. The story is styled as a space opera where Romeo and Juliette-like characters fight against their world while showing the reader the beauty in diversity. It is action packed and thought provoking. You will definitely be taken out of your world and forced to be on the run with these two amazing characters. 5 Someone did you wrong and you need a good cry? There is one book I have in my repertoire that will 100%, without a doubt, make you cry. That book is A Monster Calls by Patrick Ness. I went into this story not knowing much about it. I suggest you do the same. Just be sure to grab your tissues and clean off your mascara before cracking open the pages. Wasn’t she fantastic? 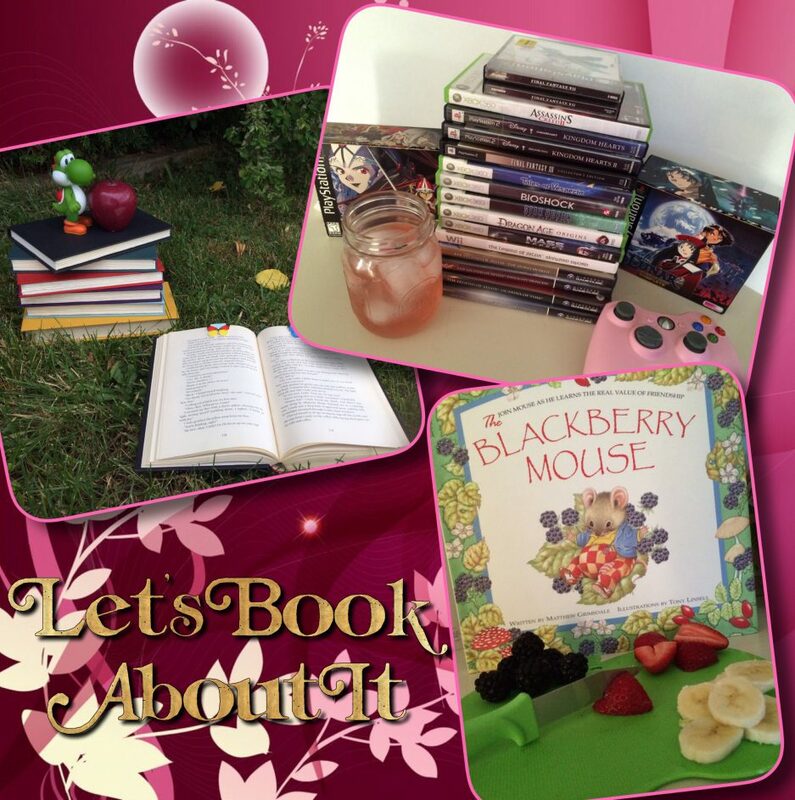 Go check out her channel for great book recommendations/reviews/wrap-ups/hauls and more! That’s all I have today from Michelle, but stay tuned for other fabulous guests weighing in on this topic! There will be a new special guest every Friday! If you would like to be a guest, send me a Tweet or DM over on Twitter. Love to have you! Thanks for reading! Please feel free to comment down below or send me a Tweet!